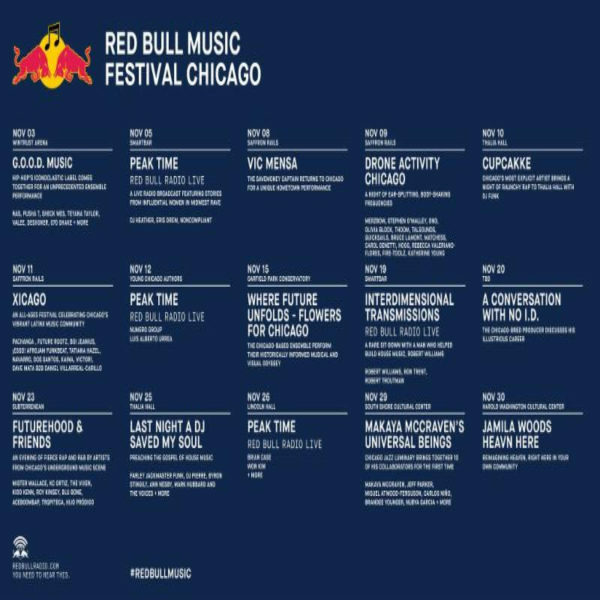 Red Bull Music has announced their 2018 lineup for its inaugural Red Bull Music Festival, set to take place in Chicago, IL throughout the month of November, which will begin November 3rd. Pusha T, Merzbow, and Jamila Woods are slated to perform, with Pusha T being a part of a G.O.O.D Music showcase along with Nas and Teyana Taylor, Sheck Wes, Valee, Desiigner, 070 Shake and more. Other artists set to perform include Cupcakke, Vic Mensa, and rapper Mister Wallace, Rapper and producer Anthony “aCeb00mbaP” Pabey and his Chicago-based LGBTQ record label Futurehood will host an evening with Rap R&B artists from Chicago’s underground music scene including Roy Kinsey. Festival attendees will also have the chance to listen to in-depth conversations with legends and rising stars. Producer No I.D. will talk about his Chicago roots and his prominent career, including producing Jay-Z’s 4:44. Red Bull Music’s Last Night a DJ Saved My Soul, and Drone Activity will be making their returns this year. Saved My Soul will include Farley Jackmaster Funk, DJ Pierre, Ten City’s Byron Stingily, Sounds of Blackness’ Ann Nesby and more will be preaching the gospel of Dance Music. dRONE Activity will be an evening of ear-splitting and body-shaking frequencies that has seen incarnations in New York, Montreal, Berlin and more. The festival will also celebrate Chicago’s vibrant Latinx music community with Xicago, an all-day, two-stage mini-festival featuring Pachanga, Future Rootz, Boy Jeanius, ¡ESSO! Afrojam Funkbeat, Tatiana Hazel, Kaina and more. Tickets will go on sale for the festival on Septemeber 25th at 10 AM CT. Tickets can be purchased here.